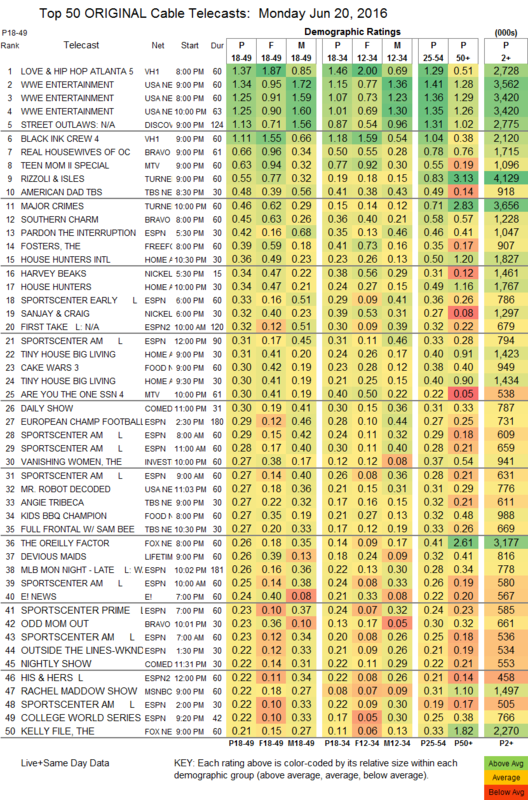 NETWORK FINALS: THE BACHELORETTE gained 0.1 in final numbers, but MISTRESSES lost the same (the former didn’t end until 10:01PM, which often causes a one-tenth shift in finals when the 10PM show is lower-rated). In addition, SPARTAN lost 0.1. CABLE HIGHLIGHTS: On Freeform, THE FOSTERS returned at 0.39, GUILT dropped 0.04 to a dismal 0.12, and MONICA THE MEDIUM gained 0.02 to 0.11. On Bravo, the season premiere of REAL HOUSEWIVES OF ORANGE COUNTY was at 0.66, SOUTHERN CHARM lost a tick to 0.45, and the season premiere of ODD MOM OUT was at 0.23. A MR ROBOT DECODED special on USA that was basically a promo for the new season in July showed that fans haven’t forgotten the show at 0.27. No surprises at the top of Monday cable. VH1 returned from its week off with LOVE & HIP-HOP down 0.04 from 2 weeks ago to 1.37, and BLACK INK CREW up a tick to 1.11. USA’s WWE was at 1.34/1.25/1.25, way up from last week’s 1.04/1.00/0.90, which had to face an NBA Finals game. Discovery’s STREET OUTLAWS aired a 2-hour episode at 1.13, up 0.17 from last week’s regular episode. On MTV, TEEN MOM (listed as a “special,” a word MTV throws around a lot) was down 0.09 from last week’s “special” to 0.63, while ARE YOU THE ONE dropped 0.07 to 0.30, and SCREAM fell 0.04 to 0.13. On TNT, RIZZOLI & ISLES lost 0.06 to 0.55, and MAJOR CRIMES rose 0.04 to 0.46. On TBS, AMERICAN DAD dropped 0.06 to 0.48, ANGIE TRIBECA shed 0.03 to 0.27, and FULL FRONTAL held at 0.27. On HGTV, HOUSE HUNTERS INTL ticked down to 0.36, HOUSE HUNTERS was down 0.04 to 0.34, and TINY HOUSE, BIG LIVING fell to 0.31/0.30 from last week’s 0.39. On Food Network, CAKE WARS gained 0.03 to 0.30, and KIDS BBQ CHAMPIONSHIP ticked up to 0.27. Lifetime’s DEVIOUS MAIDS fell 0.07 to 0.26, and UNREAL slipped 0.02 to 0.21. History’s BARBARIANS RISING rose 0.06 to 0.21. AMC’s TURN grew by 0.06 to 0.17. 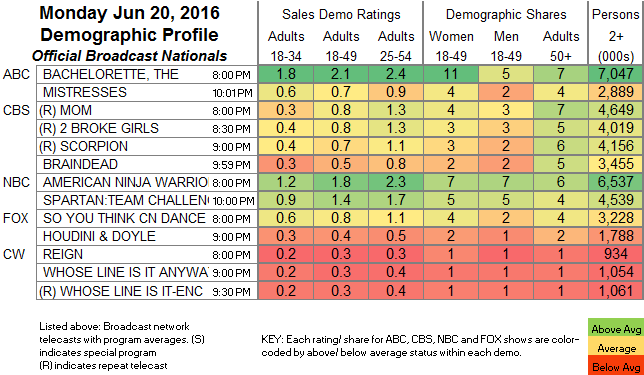 Syfy’s 12 MONKEYS ticked up to 0.11, while HUNTERS lost 0.03 to 0.07.